Caribbean dry forests with trees such as Gumbo Limbo, Pigeon-Plum, and West Indies Mahogany; remote breeding colonies of Sooty Tern, Brown Noddy, and Masked Booby; a cast of over twenty species of wintering warbler such as Black-throated Blue, Magnolia, and Worm-eating; an assortment of West Indies specialties such as Black-whiskered Vireo, Antillean Nighthawk, and Mangrove Cuckoo — this could easily be a description of the birding on a Caribbean island. It is also a good description of the birding in southernmost Florida. Many birders are aware that the Caribbean specialties, tropical seabird colonies, and even the menagerie of exotics are a unique feature of this part of the United States. However, few realize how unique and how good the birding can be here. Sure, Miami and the Florida Keys do not boast any endemics (‘Cape Sable’ Seaside Sparrow is close) at the species level. The area even lacks many species which are quintessential North American birds such as Song Sparrow and Carolina Chickadee or receives them only as occasional winter irruptions such as American Robin and American Goldfinch. Nonetheless, by straddling the border between the birds from the south and those from the north (and receiving a great deal of western birds in winter as well), Miami-Dade and Monroe collectively have one of the highest county lists east of the Mississippi River. In this article, we will touch upon the high diversity of passerines that either winter or migrate through southeastern Florida, the dynamics of bird colonization by both natural range expansions and introductions, and the large number of strays that show up annually from three different sources. Magnolia Warbler is an annual winter resident in small numbers in Miami-Dade, FL. 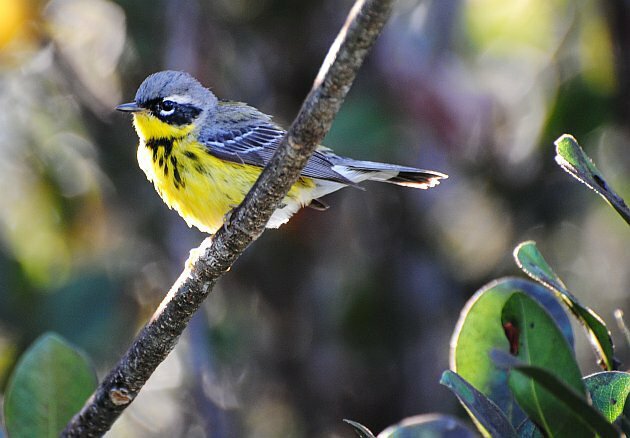 Few birders realize how many warblers actually do winter in southernmost Florida — even long time birders within the state. Many visitors who come through Orlando or Tampa see maybe eight or ten species on a winter trip. By only driving four hours to the south, birders can easily double that figure with species like Cape May, Wilson’s, and Nashville Warbler — and there are always surprises such as a wintering Blue-winged or Hooded Warbler. It’s not just the warblers as other eastern birds such as Yellow-throated Vireo, Summer Tanager, and Least Flycatcher also winter annually in small numbers in the various parks, preserves, and management areas. Many summer residents of the southwest and the Great Plains also reside in balmy Miami-Dade for the winter such as Brown-crested Flycatcher, Bell’s Vireo, and Dickcissel. 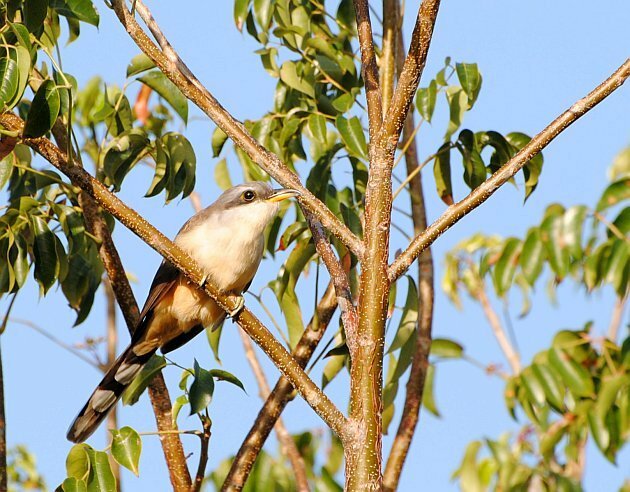 The markedly warmer climate and lush vegetation dominated by native plant species of West Indian origin seem to ensure that birds return to successfully winter in southern Florida again and again. 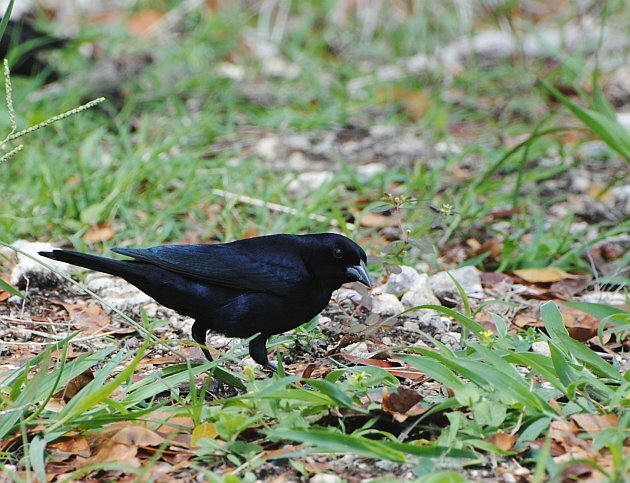 Shiny Cowbird is a newcomer to the avifauna of southeast Florida. From an evolutionary perspective, southern Florida functions like an island. A cool climate on one side and wide expanses of water on the others creates isolation as many temperate land bird species seem unable to colonize areas south of Lake Okeechobee. There has also never been a land bridge to any islands in the Caribbean. Coupled with its geologic youth, this makes the southern tip of the state function as a bit of an island experiment. Only land birds that are strong fliers (White-crowned Pigeon, Antillean Nighthawk), highly migratory (Gray Kingbird, Black-whiskered Vireo), or have strong dispersal capabilities (Smooth-billed Ani (now apparently extirpated), Mangrove Cuckoo) have been able to colonize from the south while highly adaptable species such as Northern Cardinal, Blue Jay, and Northern Mockingbird have done so from the north. Some species such as ‘Golden’ Yellow Warbler (1940s) and Cave Swallow (1980s) began breeding in Florida only recently — if left to their own devices, perhaps others such as Bananaquit and Western Spindalis would find their way as regular breeders here as well. Humans have also participated in this process by introducing a long list of birds such as Egyptian Goose, Purple Swamphen, and Common Myna. In fact, it was the explosive expansion of introduced Eurasian Collared-Dove which lead to the range expansion of Cooper’s Hawks in urban Miami as breeders. The dynamics of colonization by both natural range expansion and introduced species is part of what makes birding here so interesting for someone who loves biogeography! It also leads to a steadily growing list of regularly occurring species. 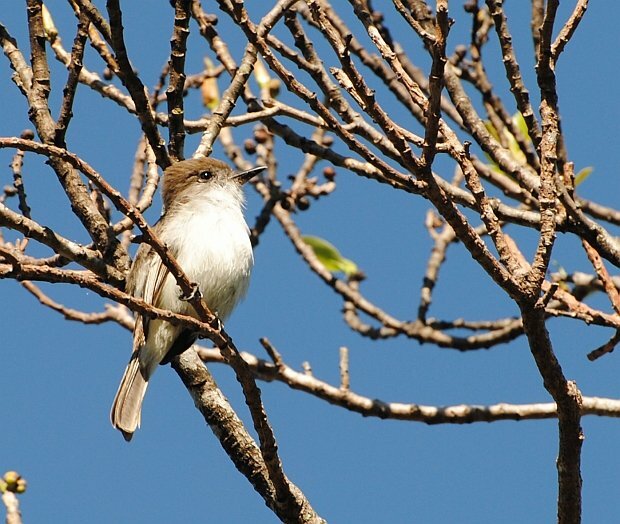 La Sagra’s Flycatcher is a nearly annual vagrant from the Caribbean. One of the greatest features of Miami and Florida Keys birding is the high chance of finding something that is out of place. These rarities tend to come from three main sources: the northern United States, western United States, and Caribbean. Most records of northern and western vagrants occur in the winter months. Northern strays include Razorbill, Common Eider, Lapland Longspur, and many more within the city limits of Miami. Western vagrants include Buff-bellied Hummingbird, Cassin’s Kingbird, Townsend’s Warbler, and others. Caribbean strays can occur at any time of year, and these are often the most desirable bird species for visiting birders. La Sagra’s Flycatcher, Thick-billed Vireo, Western Spindalis, and Bahama Mockingbird are the most regularly occurring, but other species show up too like Loggerhead Kingbird and Bahama Woodstar. Some species like Cuban Emerald are potential and expected ABA firsts at some point — and there is always a chance for a discovery like that to happen on any outing. Within only the past seven years, humble Matheson Hammock Park hosted Western Tanager, Thick-billed Vireo, Yellow-green Vireo, and La Sagra’s Flycatcher, illustrating the potential. In conclusion, the southern tip of Florida has a little bit of everything to offer the resident or visiting birder: a long list of wintering land birds, a dynamic, continuously changing avifauna, and a good probability of finding regional and ABA rarities. If you would like to make a trip to southern Florida in search of Caribbean specialties, exotics, or general birding, please visit my webpage at www.ecoavian.com or contact me by email at csanchez1230@gmail.com to inquiry about my guiding services. Where Are You Birding This First Weekend of May 2014?